Zooplankton may be tiny, but their importance to the health of the planet is not – they are microscopic life that makes a huge contribution to the fine balance of ocean ecosystems. 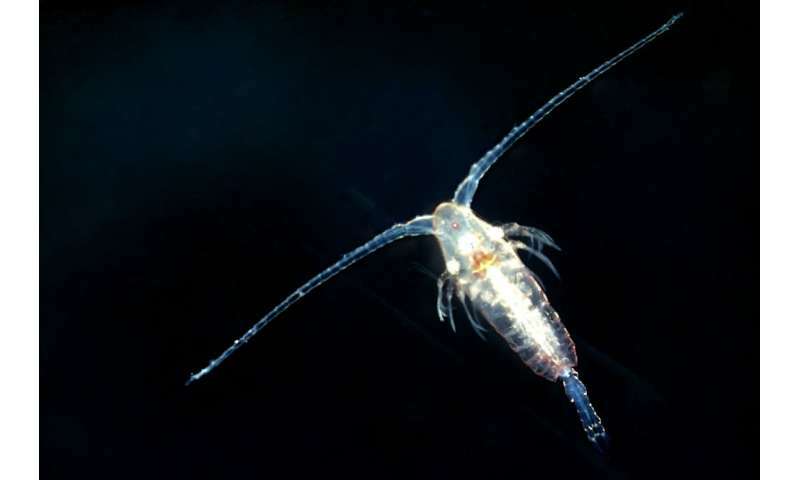 Copepods make up a significant proportion of zooplankton biomass – tiny invertebrates that are the key prey resource for many marine animals, from other zooplankton and fish larvae to sharks and whales, and are a crucial part of the food web. Mortality—be it death as a result of environmental conditions or by becoming a meal for a larger predator—is of course an integral part of zooplankton population dynamics. But these losses are generally harder to quantify than the gains to a population via reproduction. PML scientists studying the important copepod Calanus helgolandicus have now discovered links between their mortality rates and predators, and also temperature and wind speed, and how these factors influence the delicate balance of copepod populations. Warmer waters could mean an increase in danger for adult copepods, in the form of more abundant gelatinous predators like jellyfish and comb jellies. PML researchers have found that higher mortality rates are related to both higher temperatures and greater predator abundance, with gelatinous predators highlighted as the leading agent for C. helgolandicus population control in the English Channel. Windy weather, too, has an impact. For copepods that manage to evade predators, environmental conditions can still take their toll; deaths that don't involve becoming a predator's lunch are instead correlated with high wind speeds and greater ocean turbulence. "We currently know very little about zooplankton death, basically because we can't tag them to find out where they go and how they die," said lead author Jacqueline Maud. "Our work goes some way towards identifying and quantifying the different types of mortality, so that we can understand what's really going on in marine ecosystems. In terms of C. helgolandicus, we found that it is the jellies that really control the population, and also that extreme weather events can impact on this tiny—but incredibly important—member of the zooplankton community."